Two people were killed in quick succession late last year riding their bikes on the Mayor's Cycle Superhighway (CS2) at Bow roundabout in East London. There was justifiable anger amongst the cycling community at these deaths, and outrage that their recommendations to make Bow safe for all road users had been systematically ignored by Transport for London, as had the recommendations of their own engineering consultants, Jacobs. Perhaps this put TfL over a bit of a legal barrel, or perhaps we are really starting to get through to the people in charge of our streets, but true to their word TfL have acted and have promised they will now change the road layout at Bow. From Transport for London: "Cycling groups and the local authorities are being asked for their views on plans to allow cyclists an ‘early start’ on green lights to get them around the roundabout ahead of other traffic. Another proposal is to reduce the flyover from two traffic lanes to one in both directions to allow the creation of dedicated cycle lanes. 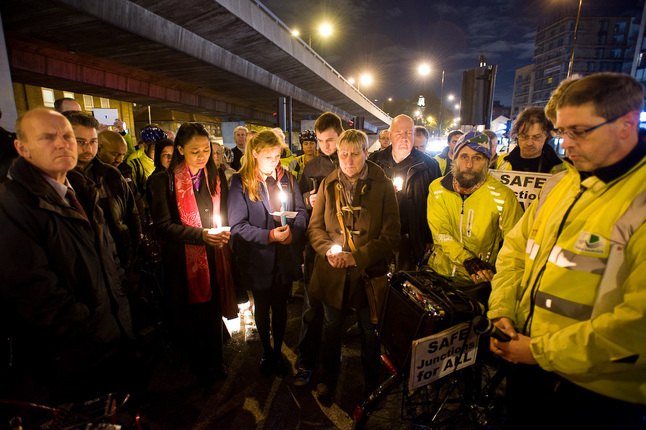 The vigil at Bow roundabout organised by local cycling activists in memory of Brian Dorling and Svetlana Tereschenko. "Transport for London also proposes to install new dedicated cycle lanes on the east and westbound approaches of the roundabout, allowing cyclists to approach the advance stop lines at the junctions without the need to filter through traffic. Advanced Stop Lines would also be made deeper on both approaches to the roundabout to ensure that cyclists have a clear visible space in front of any traffic." Bow roundabout from above; this is a place where people live and work, not just a transport corridor. I'm especially pleased that Mr Daniels is keeping his eye on the long game with Bow, as despite these welcome changes the area will still be appalling for pedestrians. TfL state in their press release that they still cannot find a solution to create safe pedestrian crossings without causing traffic delays. However, I am cautiously optimistic and welcoming of this latest development from the Mayor's transport authority. 12 months ago their standard response would have been that the key to all cyclist's safety is better driver awareness and more cycle and HGV training. Whilst these two pillars are worthy in themselves, myself and Danny from Cyclists in the City as well as the LCC have been pushing and pushing and pushing - at Blackfriars, at King's Cross, at Bow - to explain that the very layout and design of our roads is a contributory factor to creating both statistical and subjective safety. In that sense, today's news from TfL feels like a small "win" though of course it's tragic that people had to die here before calls to rectify the layout of this junction were taken seriously. TfL have also committed to review all 375 junctions on the Cycle Superhighways and over 140 major junctions on the TfL Road Network (TLRN red routes) so I'll be keeping a close eye on developments and hope that this is the start of a real and genuine improvement for people on bikes all across London. For all those of you who have campaigned for change at Bow, written to the Mayor (and over 2500 of you did! ), picketed and attended vigils, well done; you should feel proud for getting involved in how our city is run and for helping to enact positive change. TfL have moved quickly like this before; after two deaths on Blackfriars Bridge back in 2004 they remodelled the road rapidly to create the cycle lanes that exist there now and promised that cyclist's needs would be incorporated in future designs. To an extent that all went very quiet and off the radar with time, especially since the arrival of the current Mayor at the helm. I cautiously and optimistically welcome today's news from TfL, but let us all remain vigilant to ensure this doesn't happen again and that all future cycle facilities and roads where people are to be encouraged to ride are fit for use. The proposals for Bow aren't perfect but they are a small step in the right direction, and with proper consultation with cycling groups and local stakeholders hopefully a workable, safe and inviting solution can be found. The full details from TfL can be found here. The London Cycling Campaign have more details on their website here, with further thoughts from Danny at Cyclists in the City over here. Thanks for the update. This sounds like good news - hopefully progress will continue to other junctions and roads. It would be useful to find out who at TfL changed their minds, and why. It's interesting you mention the Blackfriars Bridge example - and how that might be reverting back to a dangerous route. What is the situation with Black Friars at the moment? No wonder cyclists are getting hurt. Some of the cyclists in the video had no front or rear lights. Some of the lights were so small that at first I thought they had none; at a busy junction like that with bright car lights they will be almost invisible. If cyclists are stupid enough to cycle at night with such poor lighting then they get no sympathy from me if they are hurt. Instead of spending money improving the junction they should spend it on enforcement and get these idiots off the road. Just pass a law that anyone cycling after dark without adequate lighting gets their bike confiscated on the spot. I'm a keen cyclist as well as a motorist. I rather think you're missing the point. I agree there are some poor cyclists out there. There's also poor taxi drivers - should we not improve their taxi ranks as a consequence? What about bad bus users - should we take away their service until they learn to behave? Should we penalise the majority because of the actions of the minority? Last week on the M4 everyone was driving over 70mph - surely as dangerous as cycling with poor lighting - maybe we should cease investment in the motorway network immediately?! If you read my article again you'll see that I'm all for more training for cyclists, and more driver awareness. But training cyclists (Mums, children, elderly people - this is a residential route, and the key route to the Olympics after all) to ride on bad infrastructure which is negligent in it's design and exists only to encourage the maximum through put of as many cars as possible is a bloody disgrace. BTW, you're argument is somewhat flawed. You say that cyclists will hardly be seen with all those powerful car lights. Makes me wonder what on earth the purpose of those car lights are then, if they don't illuminate things in their paths (like pedestrians). I hope you feel better about your rant, though. It's good to get it off your chest. its criminally negligent that a new junction created from scratch was built in the middle of a city to motorway appropriate speeds, the arial view makes it abundantly clear just how much wasted space there is. 8 lanes across for motor vehicles in each direction! and theres not even pedestrian crossings. Why no corporate manslaughter charges here? There are several things about riding in London that vie for the title of What Sam Dislikes Most This Week. It's the turn of the ASL again right now. I'm highly sceptical that deeper ASLs will much improve things. Drivers don't know what they are and misuse them through ignorance, use them as extra braking space, creep into them gradually as the lights refuse to change in their favour, use them to get alongside you so they don't have to wait to overtake you when the lights do change etc. If the ASLs are enforced, then with the (*ahem*) innovative early start green light phase and the dedicated cycle lanes on the east-west appraoches, we're getting somewhere. Still, it's good to see TfL have responded with something better than a lick of paint. If we keep up the pressure, this could be the year - for numerous reasons - that things really begin to change for the better. Whether it is due to bad infrastructure or bad drivers of cycles or automobiles, when someone gets hurt, that's a terrible thing. A life is a terrible thing to waste! Sorry to hear about the loss of your city's cyclists! Be safe out there and I hope your risk of collision goes down! A good article which is well argued and to the point. It is distressing to see safety plans for pedestrians and cyclists dismissed if they are judged to 'cause traffic delays'. I had an informal chat with a traffic policeman (who was threatening to book me for cycling on a pavement which was shared use until I persuaded him to take a look at the shared-use signs at its either end) and he agreed that there was much confusion on all sides and that things are, sadly, going to get worse before they get better. As a father of three, cycling children in the city, this fills me with dread that they may be one of the casualties to be further sacrificed until finally TfL see sense. I have been a cyclist in central London since 1972, including as one of the first cycle dispatch riders and in my opinion has never been or felt more dangerous to traverse our fair city by bike. Thanks everyone for all your comments. @Lawrence I fear your experience with the police is not as rare as we might like. There are now further details on the TfL website, including videos of how their proposals will work, which I'm just looking at now.